250 lb. Cable Ties | Nylon Zip Ties – 250 lb. Capacity | Cal Fasteners, Inc.
For the most extreme applications, Cal Fasteners stocks 250-pound capacity nylon cable ties. Available in natural nylon and UV-treated black nylon. 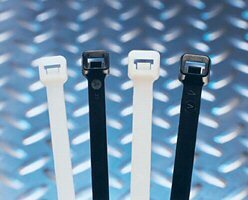 These zip ties are specially designed for superior durability and ease of use. Tapered tails and finger grips allow for fast and easy handling, alignment, and tightening; low insertion and pull through force makes for simple installation. Unique pawl and teeth designs and single-piece construction provide high tensile strength. ROHS compliant. Request a quote on 250 lb. zip ties, or contact Cal Fasteners to learn more.